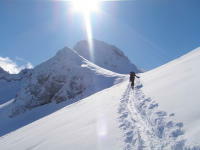 Away from ski resort bustle and ski lifts, enjoy the calm and serenity of nature on your ski. From beginner to expert, from 1/2 day to a full day, in the Mont Blanc massif or at the heart of the Aravis, ski touring is for everyone ! From beginner to expert, from 1/2 day to a full day, in the Mont Blanc massif or at the heart of the Aravis, ski touring is for everyone !